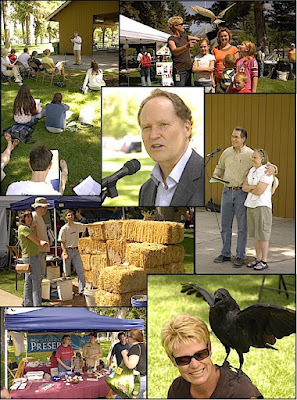 The National Sierra Club has posted this article on the UVSF's Living Green in Utah Valley Expo 2008. It's in their Grassroots Scrapbook web site. Click HERE or on the image at left to see the whole article. Nice work Marsha!! The UVSF held its Living Green in Utah Valley 2008 Expo on September 6th. The "main event" was our awarding the first annual Earth Stewardship Award to BYU Professor Arden Pope for his pioneering work linking air pollution (PM 2.5) to human health problems and to Dr. Brian Moench and the Utah Physicians for a Healthy Environment for their work in combating air pollution. This is our second annual Living Green expo. We expect to do this again next September. And again, our deepest appreciation to Marsha McLean for her tireless efforts to make this Expo happen. We also thank the community sponors of this event.